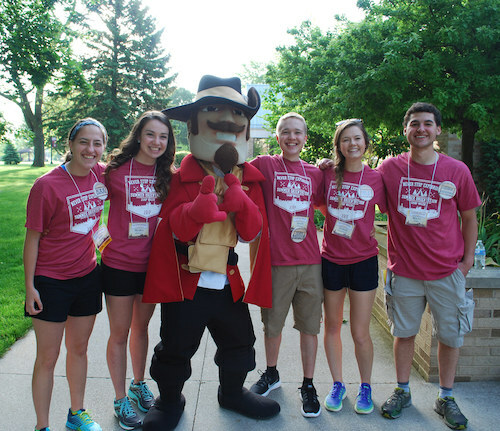 The Maroon & Gold Student Mentor program is a vital part of the Orientation Experience for incoming freshmen students at Walsh University. Mentors will ensure that first-year students excel in their academics, personal growth, and interpersonal relationships in conjunction with Walsh University’s mission and values. Walsh University strives to ensure our incoming students feel supported, connected and engaged throughout the summer months leading up to and into the start of their first academic semester. Mentors are responsible for providing intentional engagement and support from the time an incoming freshman student arrives for the summer Cavalier Connection through the student’s first semester on campus. Mentors receive extensive training on leadership, peer support, communication, conflict management, and campus support services. For more information about Maroon & Gold Mentors, please contact Bernadette Strausbaugh, Director of Student Activities and Orientation at bstrausbaugh@walsh.edu or 330-490-7173.